A picture of the ferry named the Apollo that travels between Newfoundland and Labrador on a daily basis when weather permits. 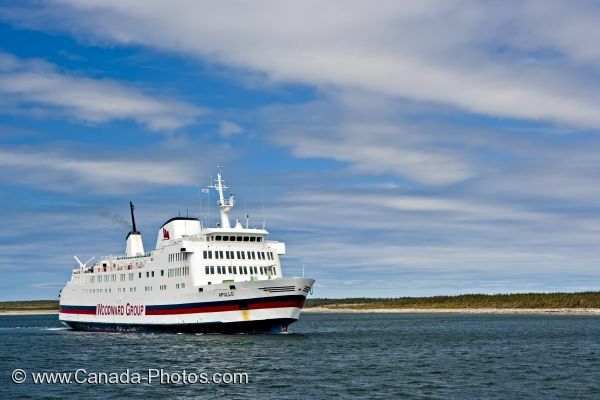 This ferry known as the "Apollo" takes passengers back and forth between Labrador and Newfoundland on daily trips from May 1 to the middle of January as long as the weather cooperates. A short trip that takes about one and half hours where you can enjoy the beautiful scenery of the area while vacationing in Newfoundland Labrador. This picture was taken as the ferry arrives at the terminal in St. Barbe, Newfoundland. Labrador Ferry 'Apollo' arriving at the ferry terminal in St Barbe along Highway 430, Viking Trail, Trails to the Vikings, Great Northern Peninsula, Northern Peninsula, Strait of Belle Isle, Newfoundland, Canada. Picture of the ferry named the "Apollo" that transports people between Newfoundland and Labrador.